You’ve probably seen the name in all caps permeating your social media — MVMT — pulling in your gaze with modern, beautifully crafted watches and holding your wallet hostage with unbelievably affordable pricing. 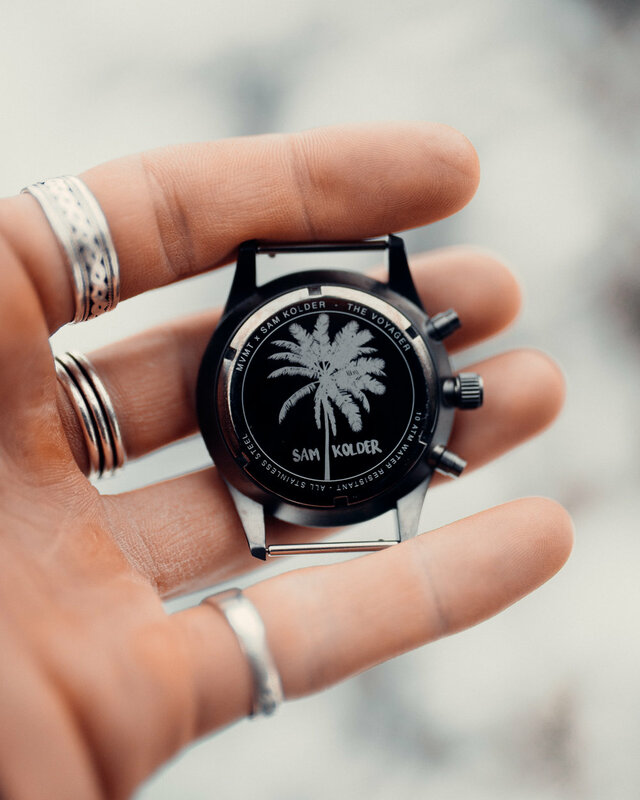 MVMT is a relatively new brand, coming onto the scene about 6 years ago with an Indiegogo campaign that garnered attention from 300,000 supporters worldwide. Part of what makes MVMT stand out are the crew that work on, for and with the company — they’re completely tapped into the pulse of what’s hot and relevant. They play to the tastes of the modern worker and the thrill-seeking traveler. MVMT co-founder, Jake Kassan, took the time to talk to Flaunt and it became immediately clear why the company has grown like it has. While discussing MVMT’s business model, Jake directed the conversation towards his employees, the people who form the company’s identity. “I think we just always wanted to be true to who we are as people behind the brand. So just telling our story, even now with 40 employees, we show behind the brand, and employees here are on our social media channel,” Jake tells me matter-of-factly. He’s trying to get across the influence that his small but growing operation plays in developing what MVMT means to us as consumers. MVMT has recently been acquired by longstanding name in the watch industry, Movado. This won’t affect the company’s operation, Jake insisted, but rather it will allow MVMT to pursue it’s current market on a larger scale. While musing about why Movado showed interest in such a young company, Jake presumed that they “bought us because they believe that this brand is gonna be around for decades and decades to come and that they wanna see this through and believe where we’re headed.” And if that’s the case, Movado wasn’t wrong. A few weeks ago, the still-growing watch company released a new line, called “Arc Automatic”. This is MVMT’s first exploration into the world of automatic watches. For those of you who still use your phone’s clock, the difference between most watches, which are run on batteries and quartz movement, and an automatic watch lies in the operating mechanisms. Using your own body’s movements to constantly wind up the watch, automatic watches not only require a higher grade of materials for production, they also are some of the most accurate time pieces on the market. For a company that offers high-quality product for lower prices, this is a big step forward. Jake tells me that aside from the prestige that comes with offering such a top shelf product, it’s exciting for him because of how this will affect his loyal and potential customers. “We’ve actually seen customers ask for automatic watches and as we’ve grown — the company’s now almost six years old — they’ve grown. They have more eclectic tastes in watches, so it’s kind of cool to see them grow with us.” For Jake, the beauty of the market is that shoppers and followers can challenge MVMT — with what they have to offer and where they will continue to grow. MVMT’s become a well-established company, selling customers beautiful, functional watches at a reasonable rate. But they’ve been growing and have started developing other areas of fashion wear. Offering bracelets, sunglasses, and now necklaces, MVMT wanted to provide customers with an easy way to gift shop. 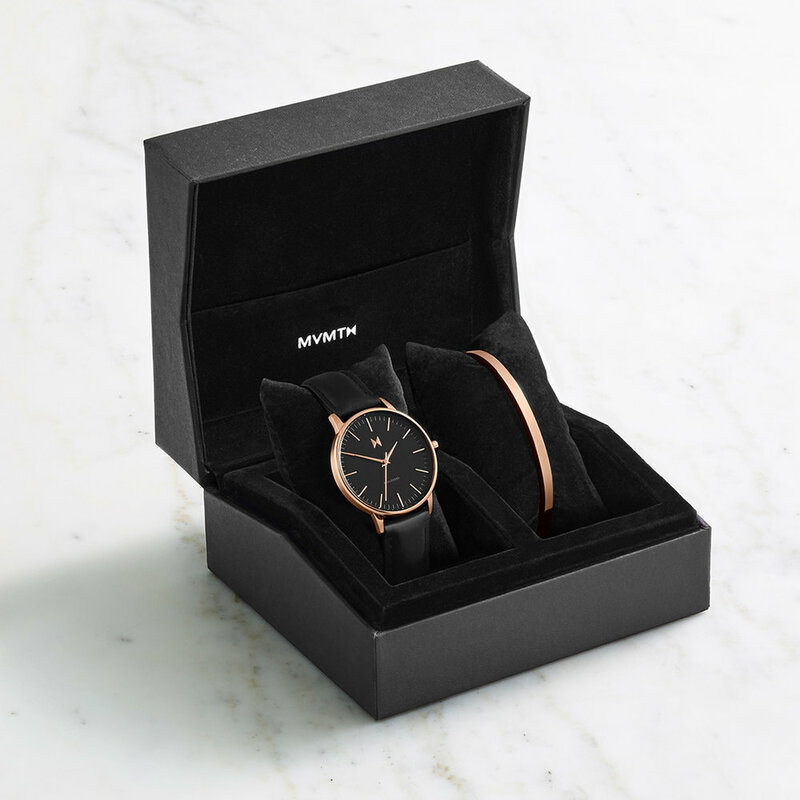 MVMT sells holiday gift boxes for both men and women. The men’s gift box contains a high-quality watch and a second wrist band, sometimes paired with sunglasses. For the women’s, it means a watch, and a bracelet. The combinations offered allow you to choose a set for every hat, personality, or pet you choose to sport on a given day.